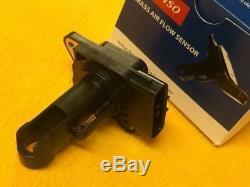 MAF for Subaru MY07 FORESTER 2.5L EJ253 Air flow mass meter sensor AFM Genuine. Cross reference: AFM-025 22680AA310 1974002090. 1 x Denso Air Mass/Flow Meter (AMM AFM) Insert. Direct replacement for original part, no modifications needed. MY07 Subaru Forester 2.5L non Turbo. Doesn't suit the MY08-on 2.5L. THE FITMENTS GIVEN ARE AS ACCURATE AS WE CAN MAKE THEN BUT WE DO ASK THAT YOU CAREFULLY CHECK THE PHOTOS AGAINST THE ORIGINAL TO AVOID DISAPOINTMENT. Fitment lists are for Australian delivered/dom. Cles and may not apply to imports. Type this code in the search box for a matching plug. Standard post is without tracking. If you cant collect from that address the order will need to be cancelled. We combine post on most orders. Do not checkout to pay for this item (yet). Checkout with this new invoice. GST is included in all our prices. But we will contact you ASAP to let you know if there are any problems. Packaging is not part of the'sale' and may vary to that shown, may not be included in the package when sent and if damaged isn't considered to be damaged goods. The item "MAF for Subaru MY07 FORESTER 2.5L EJ253 Air flow mass meter sensor AFM Genuine" is in sale since Monday, June 12, 2017. This item is in the category "Vehicle Parts & Accessories\Car & Truck Parts\Air Intake, Fuel Delivery\Sensors". The seller is "ddi_auto" and is located in Riverview (Brisbane). This item can be shipped worldwide.